Kobe(Kōbe-shi) is the capital city of Hyōgo Prefecture and a prominent seaport city in Japan with a population of about 1.5 million. The city is located in the Kansai region of Japan to the west of Osaka. Kobe is classified as one of Japan's 15 designated cities and is a part of the Osaka-Kobe-Kyoto metropolitan sprawl. It was one of the first cities to open for trade with the Western world in 1868, and as such, it is known as a cosmopolitan port city. Consistent with this reputation, Kobe has a population of 45,000 foreign residents from more than 100 countries. The city hosts the Asian or Japan headquarters of a number of companies including Procter & Gamble and Nestlé, and is the point of origin and namesake of Kobe beef. Kobe is also famous for the Arima Onsen (hot springs), and some notable buildings include the Ikuta Shrine as well as the Kobe Port Tower. The city was severely affected by the 1995 Great Hanshin Earthquake, in which over 5000 residents lost their lives. Kobe has largely recovered from the damage. Kobe's history dates back to the eighth century when the area was known as Ōwada Anchorage (Ōwada-no-tomari). The city was briefly the capital of Japan in 1180 C.E. at the end of the Heian period, when Taira no Kiyomori moved his grandson Emperor Antoku to Fukuhara. The exact location is not known for certain, but is probably the neighborhood of the same name in Hyōgo-ku, Kobe. The Emperor returned to Kyoto after about five months. As the port grew, it became an important hub for trade with China and other countries, and in the thirteenth century, the city came to be known by the name Hyōgo Port (Hyōgo-tsu). 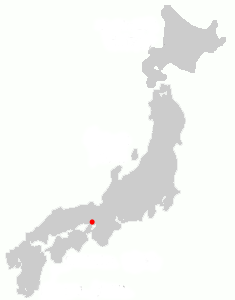 During this time, Hyōgo Port along with northern Osaka comprised the province of Settsu. Later, during the Edo period, the eastern parts of present-day Kobe came under the jurisdiction of the Amagasaki Domain (Amagasaki-han) and the western parts under that of the Akashi Domain (Akashi-han), while the center was controlled directly by the Tokugawa shogunate. It was not until the abolition of the former feudal clan system, known as han, in 1871 and the establishment of the current prefecture system that the area became politically distinct. Following the Meiji Restoration and the end of the policy of seclusion (Sakoku), in 1868, Hyōgo Port was one of the first ports to open for trade with Western countries. The region has since been identified with the West, and many foreign residences from the period remain in Kobe's Kitano area (Kitano-cho). 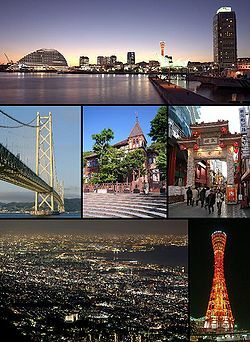 Kobe, as it is known today, was founded on April 1, 1889, and was designated on September 1, 1956 by government ordinance. 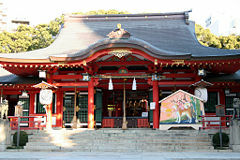 The history of Kobe is closely tied to that of the Ikuta Shrine, and in fact the name "Kobe" derives from kanbe, an archaic name for those who supported the shrine. During the course of World War II, Kobe was bombed with incendiary bombs by B-29 (B-29 Superfortress) bombers on March 17, 1945, causing the death of 8,841 residents and destroying 21 percent of Kobe's urban area. It is this incident that inspired the well-known Studio Ghibli animated film Grave of the Fireflies and the 1967 book Grave of the Fireflies by Akiyuki Nosaka on which it was based. Following continuous pressure from citizens, on March 18, 1975, the Kobe City Council passed an ordinance banning vessels carrying nuclear weapons from Kobe Port. This effectively prevented any U.S. warships from entering the port, policy being not to disclose whether any warship is carrying nuclear weapons. This nonproliferation policy has been termed the "Kobe Formula" (Japan's non-nuclear policy). On January 17, 1995 an earthquake measuring at 7.3 on the Richter Scale occurred at 05:46 A.M. JST near the city. There were 6,434 people killed, 300,000 were made homeless, and large portions of the port facilities and other parts of the city were destroyed. It was one of the most costly natural disasters in modern history. The earthquake notably destroyed the Hanshin Expressway, an elevated freeway which dramatically toppled over. Within Japan, the earthquake is known as the Great Hanshin Earthquake (or the Hanshin-Awaji Earthquake). To commemorate Kobe's recovery from the 1995 quake, the city holds an annual event called the Kobe Luminare, where every December the city hall is decorated with illuminated metal archways. Kobe was Japan's busiest port and one of Asia's top ports until the Great Hanshin Earthquake occurred. Kobe has since dropped to the thirty-second busiest port worldwide (as of 2004). In spite of the earthquake, Kobe remains Japan's third busiest port (as of 1999). Wedged in between the coast and the mountains, the city of Kobe is long and narrow. To the east is the city of Ashiya (Ashiya Hyōgo), while the city of Akashi (Akashi Hyōgo) lies to its west. The landmark of the port area is the red steel Kobe Port Tower (hyperboloid structure). A giant ferris wheel sits in nearby Harborland, a notable tourist promenade, and offers spectacular views of the surroundings including the bay area, especially at night. Two artificial islands, Port Island and Rokko Island, have been constructed to give the city room to expand. The city serves as one of the most important seaports in Japan. Away from the seaside at the heart of Kobe lie the Motomachi and Kokashita districts as well as Kobe's Chinatown, Nankinmachi, all well-known retail areas. A multitude of train lines cross the city from east to west. The main transport hub is Sannomiya Station, with the eponymous Kobe Station located to the west and the Shinkansen Shin-Kobe Station to the north. Mount Rokko overlooks Kobe at an elevation of 931 meters. During the autumn season, it is famous for the rich change in colors of its forests. Kobe is famous for its Kobe beef and Arima Onsen (hot springs). As of 2002, there are 1,450 public parks, giving Kobe a reputation for being "green," and a very livable place for families. The most notable building is the Ikuta Shrine, founded in the third century B.C.E., which later featured prominently in the battle of Ichi–no–Tani (Gempei War) between two warring clans that determined the outcome of modern Japan. Another notable landmark is the Kobe Port Tower. It is well known for the night view of the city both from the coast and its exotic atmosphere which has mainly come from its history as a port city. The city is widely associated with the cosmopolitanism and fashion, encapsulated in the Japanese phrase, "If you can't go to Paris, go to Kobe." The biannual fashion event Kobe Collection is held in Kobe, while the jazz festival "Kobe Jazz Street" has been held every October at jazz clubs and hotels since 1981. After the opening of Japan, Kobe became very much an attraction to an international community, that gathered diplomats and foreign dignitaries, including Rudyard Kipling, around the famous "Oriental Hotel". Nearby Mount Rokko is the site of Japan's first golf course, Kobe Golf Club, established by British expatriate Arthur Hasketh Groom in 1903, and Japan's first mosque, Kobe Mosque, built in 1935. 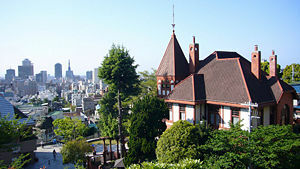 The city also hosts the Kobe Regatta & Athletic Club, founded in 1870 by Alexander Cameron Sim, a prominent foreign cemetery, and a number of Western-style residences from the nineteenth century. Kobe is home to Kobe University, which traces its roots back to 1902. Of a total population of about one and a half million residents, there is an international population of about 44,000: comprised of Koreans, Chinese, Vietnamese, Indians, North Americans, British, Germans, and others, including a Jewish community. Most of the movie Sayonara (1957) starring Marlon Brando takes place in Kobe. Kobe is also the setting of the Studio Ghibli antimated film Grave of the Fireflies. (1988) directed by Isao Takahata. Kobe is well-known for its sake: The area of Nada-ku along with Fushimi-ku in Kyoto accounts for 45 percent of Japan's sake production. Sannomiya Station is the main hub in Kobe, serving as the transfer point for the three major intercity rail lines. The JR Kobe Line connects Kobe to Osaka and Himeji while both the Hankyu Kobe Line and the Hanshin Main Line run from Kobe to Umeda Station in Osaka. In addition, Kobe Municipal Subway provides access to the Sanyō Shinkansen at Shin-Kobe Station. Sanyō Electric Railway trains from Himeji reach Sannomiya via the Kobe Rapid Railway. Other rail lines in Kobe include Kobe Electric Railway which runs north to Sanda and Arima Onsen. Hokushin Kyuko Railway connects Shin-Kobe Station to Tanigami Station on the Kobe Electric Railway. Kobe New Transit runs two lines, the Port Island Line from Sannomiya to Kobe Airport and the Rokko Island Line from JR Sumiyoshi Station to Rokko Island. Kobe is a hub in a number of expressways, including the Meishin Expressway (Nagoya - Kobe) and the Hanshin Expressway (Osaka - Kobe). Other expressways include the Sanyō Expressway (Kobe - Yamaguchi) and the Chūgoku Expressway (Osaka - Yamaguchi). The Kobe-Awaji-Naruto Expressway (Honshū-Shikoku Bridge Project) runs from Kobe to Naruto via Awaji Island and includes the Akashi-Kaikyo Bridge, the longest suspension bridge in the world. The new Kobe Airport was opened on a newly-built reclaimed island on February 16, 2006. The city of Kobe directly administers 169 elementary and 83 middle schools, with enrollments of approximately 80,200 and 36,000 students, respectively. Kobe also directly controls seven of the city's twenty-eight full-time public high schools, while the remainder are administered by the Hyogo Prefectural Board of Education. In addition to public schools, four elementary schools, 14 middle schools and 25 high schools are run privately within the city. Kobe is home to 19 public and private universities and institutes of higher learning, including Kobe University and Konan University. Kobe University. Retrieved July 18, 2007. University of Hyōgo (Prefectural university). Retrieved July 18, 2007. Kobe City University of Foreign Studies. Retrieved July 18, 2007. Kobe City College of Nursing. Retrieved July 18, 2007. Konan University. Retrieved July 18, 2007. Konan Women's University. Retrieved July 18, 2007. Kobe Kaisei College (Women's university). Retrieved July 18, 2007. Kobe Gakuin University. Retrieved July 18, 2007. Kobe Design University. Retrieved July 18, 2007. Kobe International University. Retrieved July 18, 2007. Kobe Shoin Women's University. Retrieved July 18, 2007. Kobe Women's University. Retrieved July 18, 2007. Kobe Shinwa Women's University. Retrieved July 18, 2007. Kobe Pharmaceutical University. Retrieved July 18, 2007. Kobe Yamate University. Retrieved July 18, 2007. University of Marketing and Distribution Science. Retrieved July 18, 2007. Elementary and junior high schools are operated by the city of Kobe, while high schools are operated by the Hyogo Prefectural Board of Education (Retrieved July 18, 2007.). A list of Hyogo Prefectural high schools in Japanese is here (Retrieved July 18, 2007). Kobe is both an important port and manufacturing center within the Hanshin Industrial Region. Kobe is the busiest container port in the region, surpassing even Osaka, and the fourth busiest in Japan. As of 2004, the value of manufactured goods produced and exported from Kobe was ¥2.5 trillion. The four largest sectors in terms of value of goods produced are small appliances, food products, transportation equipment, and communication equipment making up over fifty percent of Kobe's manufactured goods. In terms of numbers of employees, food products, small appliances, and transportation equipment make up the three largest sectors. The city's total GDP for this same year was ¥6.3 trillion, which amounts to 34 percent of the GDP for Hyōgo Prefecture and approximately eight percent of the GDP for the whole Kansai region. Per capita income for the year was approximately ¥2.7 million. Japanese companies which have their headquarters in Kobe include ASICS, a shoe manufacturer; Daiei, a department store chain; Kawasaki Heavy Industries, an automobile and ship manufacturer; and Kobe Steel. Other companies include the confectionary manufacturers Konigs-Krone and Morozoff Ltd., Sun Television Japan and UCC Ueshima Coffee Co. There are over 100 international corporations with East-Asia or Japan headquarters in Kobe. Of these, 24 are from China, 18 from the United States, and nine from Switzerland. Some prominent corporations include Eli Lilly and Company, Nestlé, Procter & Gamble, Tempur-Pedic, and Toys "R" Us. Kobe is the site of a number of research institutes, such as the RIKEN Kobe Institute Center for developmental biology and medical imaging techniques, the National Institute of Information and Communications Technology Kobe Advanced ICT Research Center, the National Research Institute for Earth Science and Disaster Prevention, and the Asian Disaster Reduction Center. - Mainly,high value products such as Container ship, Submarine, Research Vessels and Vehicles, Nuclear reactor, Satellite. Bayer Kobe Reseach Center . Retrieved July 18, 2007. - It is also an East-Asia or Japan headquarter. - Center for Developmental Biology. ↑ Sally Hassan, April 9, 1989, "Where Japan Opened a Door To the West." New York Times, retrieved from New York Times Website on February 7, 2007. ↑ "Number of foreign corporations with headquarters in Kobe passes 100." (Japanese) in Nikkei Net. retrieved from NIKKEI.net on July 3, 2007. Nihon Kōtsū Kōsha. 1990. Travel guide: Kyoto, Nara, Osaka, Kobe. Tokyo: Japan Travel Bureau.